Also known as ‘degenerative joint disease’ and ‘degenerative arthritis’, osteoarthritis occurs in response to the breakdown of the cartilage that covers our joints. This greatly increases the amount of friction the bones receive during joint movements, which results in pain and inflammation, combined with associated joint and bone damage. Osteoarthritis can therefore cause large disruptions in our ability to function on a day to day basis, greatly inhibiting our ability to perform essential tasks of daily living, such as climbing stairs, and standing from a seated position. This often comes with a huge reduction in joint mobility, in which normal movement may also become quite painful. While joint and cartilage degeneration is considered a relatively normal part of aging, its severity can be limited by maintaining a healthy body weight, and avoiding unnecessary and repetitive joint loading. Interestingly, there has also been a host of research to suggest the consumption of specific supplements can also go a very long way to reduce the severity of osteoarthritis, while also delaying its onset. What Do Osteoarthritis Supplements Do? There is a growing body of evidence that demonstrates effective osteoarthritis supplements can reduce arthritis related inflammation, improve joint range of motion, and reduce pain in those individuals currently suffering from osteoarthritis. Additionally, there are some supplements that have also been suggested to provide the body with those nutrients essential to the growth and repair of both cartilage and joint tissue. As such, the consumption of these compounds are thought to improve the health and resilience of the joint in its entirety, greatly reducing our risk of developing osteoarthritis. Through these factors, osteoarthritis supplements can result in large improvement in our functional capacity, making our ability to manage each and every day much easier. In conjunction with this, these same supplements are likely to delay the onset of osteoarthritis in susceptible individuals considerably. What Should I Look for in an Osteoarthritis Supplement? Chondroitin: is a specific compound that is considered a type of mucopolysaccharide. These are actually a key component of the various joint structures within the body, and as such play an important role in the repair and growth of joint tissues (including cartilage). As a result, the consumption of chondroitin has been shown to cause large reduction in joint pain, combined with improvement in joint mobility, suggesting its importance at staving the off negative effects of osteoarthritis . Glucosamine: is a key compound that is used within the body to produce new cartilage. As a result, increasing glucosamine intake through supplementation is an excellent way to increase the body’s capacity to build and repair cartilage. This is essential to reducing joint degeneration and improving the state of osteoarthritic joints . Fish Oil: is a key supplement that contains two specific type of fatty acids (EPA and DHA) that have been shown to act as potent anti-inflammatories. As a result, the supplementation of fish oil has been shown to reduce joint inflammation and swelling, while improving mobility and pain levels. This can improve joint health and function in those individuals already suffering from osteoarthritis, while significantly reducing the risk of developing osteoarthritis in undiagnosed individuals . Curcumin: is actually the yellow pigment found in the spice turmeric. Similar to fish oil, curcumin has been shown to act as an extremely potent anti-inflammatory. As such, its consumption has been demonstrated to effectively reduce the negative effects of osteoarthritis, while causing large improvements in function . Taking the above into consideration, we have gone ahead and outlined what we believe to be the three best osteoarthritis supplements available on the market today. Zenwise advanced joint support is an excellent option that provides us with a good dose of Chondroitin, Glucosamine, and Turmeric. Using high quality ingredients that are absorbed readily into the bloodstream, this supplement guarantees a great degree of effectiveness. Despite coming in a t slightly higher price point than some of its competitors, this is an excellent option that is guaranteed to reduce the negative effects of osteoarthritis. As its name suggests, this supplement by Vita Breeze provides the body with a huge dosage of Chondroitin, Glucosamine, and Turmeric – all of which are integral to staving off the negative effects of osteoarthritis. As an added bonus, this particular supplement is relatively affordable, making it a great option for literally anyone. This fish oil supplement by Dr Tobias is arguably the most efficient on the market. Using extremely high quality ingredients, offered at a decent price point, you really can’t go wrong. 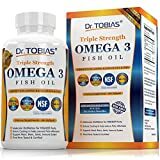 We would actually recommend that you take this fish oil supplement in conjunction with one of the other two listed above, as its effectiveness at treating osteoarthritis is going to be greatly increased when combined with chondroitin, glucosamine, and turmeric. Considering that we as a society are getting older and older, the incidence of osteoarthritis is guaranteed to keep increasing. With this in mind, supplements can play an important role in reducing our likelihood of developing osteoarthritis, while also reducing its negative impact in those individuals who have already been diagnosed. As with most things, there are many supplements available that have been suggested to treat osteoporosis effectively, although we must admit that some are much better than others. The three osteoarthritis supplements listed in this article are what we believe to be the best available on the market at the moment, in which each offers an excellent option in its own right. If you have had any experience with either osteoarthritis, or the supplements described in this article, we would love to hear about it – so drop us a comment and we will get back to you ASAP.